OIL Hospital And School Of Nursing, Duliajan Recruitment 2018 August | Pharmacist,Nursing Tutor,Librarian Posts :- OIL Hospital And School Of Nursing, Duliajan has published a recruitment notification for the month of August 2018. According the latest OIL Hospital And School Of Nursing, Duliajan Recruitment 2018, Oil India Limited (OIL) invites applications from the eligible candidates (domicile of Assam and Arunachal Pradesh) for engagement in the Pharmacist,Nursing Tutor,Librarian Posts on Contractual Basis at OIL Hospital and School of Nursing, OIL, Duliajan. We have discussed in details about this recruitment below. 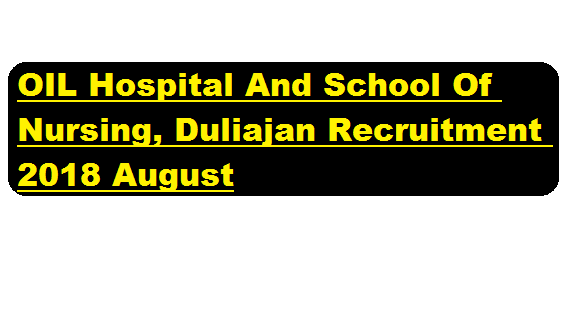 In this section, we will discuss in detail about Recruitment of various posts under OIL Hospital And School Of Nursing, Duliajan Recruitment 2018 August with all the details and requirement. i) Passed 10+2 in Science Stream from Govt. recognized Board / Institution / University. ii) Passed 02 (Two) years full time Diploma course in Pharmacy from an institution recognized by Govt. of India and the Pharmacy Council of India. iv) Must have 02 (Two) years post qualification experience. i) B.Sc. (Nursing) from a recognized University. i) Bachelor in Library & Information Science or equivalent from any recognized university. ii) Minimum 06 (six) months Diploma / Certificate in Computer Application and should be fully conversant with MS Office, Internet, E-mail correspondence etc. iii) Experience of computer application in library field will be given preference. a) Original mark-sheets, pass certificates, caste certificate (if applicable), experience certificates and other testimonials, if any. b) A set of self attested photocopies of original mark-sheets, pass certificates, caste certificate (if applicable), experience certificates and other testimonials, if any. c) 01(one) copy of recent passport size colored photograph. d) On the above scheduled date of the Walk-in-Interview, the candidate(s) will have to register themselves for the Walk-in-Interview at the venue from 07:00 – 11:00 A.M.